In 2009, the University of California, which includes 10 campuses and five medical centers, committed to purchasing 20 percent of its food from sustainable sources by 2020. According to its recently released 2016 Annual Report on Sustainable Practices, most of the UC system has met that goal early for the second year in a row. 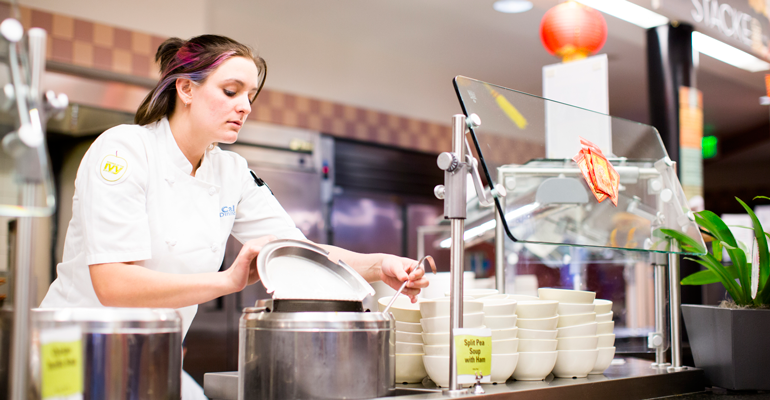 Last year, six of the 10 campus's residential dining services met the goal four years early as did four of the campus's retail services. Out of UC’s five medical centers, three also met the 20 percent sustainable food source goal in 2016. That means the UC system spent $30.3 million on sustainable foods last year, maintaining about the same sustainable food procurement numbers as 2015 despite a particularly challenging year. Despite those major challenges, the university still achieved its 2020 goal early and executed some campus-specific successes in sustainability as well. In 2016, UCLA became the largest fair trade university in the nation and UC Santa Barbara launched a Food, Nutrition and Basic Skills Program of 36 workshops that include whole-system mindfulness. Beyond burgers and pizza, students also consume large amounts of coffee, a food item that UC sources through unique partnerships. “At UC Santa Cruz, we have a sole source contract with community Agricultural Network (CAN) farmer cooperatives in Mexico and Central America. Our students visit and research these vendors ultimately bringing the coffee producers up to connect with the university community and local roasters.” Galarneau says that while traditional coffee results in a 50-cents-per-pound price return, CAN’s direct fair trade model means farmers get over $3 per pound. “Part of our approach is to show that there are procurement policies that can support and uplift communities,” says Galarneau, who says with the 2020 goal reached, the next step is about education and training. To that end, each campus runs green practice modules that explain why UC is committed to sustainability as well as the campuses’ procurement and waste stream elements that are involved. As California is such a large state, Galarneau says they can set up two different bids on the same need to reflect the geography. They also make sure small vendors have an inroad to a large university like the UC system by offering sole-source contracts in which a farmer can work with one campus before going bigger.